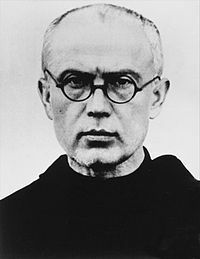 Saint Maximilian Kolbe was a Polish Conventual Franciscan Friar. During the German occupation of Poland, he remained at Niepokalanów a monastery which published a number of anti-Nazi German publications. In 1941, he was arrested and sent to Auschwitz, where in terrible circumstances he continued to work as a priest and offer solace to fellow inmates. When the Nazi guards selected 10 people to be starved to death in punishment, Kolbe volunteered to die in place of a stranger. He was later canonised as a martyr. Raymund Kolbe was born on 8 January 1894 In Zdunska Wola, in the Kingdom of Poland (then part of the Russian Empire). His father was an ethnic German and his mother Polish. His parents were relatively poor, and in 1914 his father was captured by the Russians and hanged for his part in fighting for an independent Poland. Raymund developed a strong religious yearning from an early life. He recounts an early childhood vision of the Virgin Mary. This vision was significant because he chose both the path of sanctity and also to follow the path of a martyr. Aged only 13, Kolbe and his elder brother left home to enrol in the Conventual Franciscan seminary in Lwow. This seminary was in Austria-Hungary and it meant illegally crossing the border. In 1910, he was given the religious name Maximillian and was admitted as an initiate. He took his final vows as a monk in 1914. After a short period in Krakow, Poland, Kolbe went to study in Rome, Italy. He gained a doctorate in philosophy at the Pontifical Gregorian University in 1915. In 1919 he also gained a doctorate of theology from the University of St. Bonaventure. Kolbe was ordained as a priest and after completing his studies returned to the newly independent Poland in 1919. He settled in the monastery of Niepokalanów near Warsaw. Towards the end of his studies, Kolbe suffered his first bout of tuberculosis and he became quite ill, often coughing up blood; the illness disrupted his studies. Throughout the rest of his life, he experienced poor health, but never complained, seeing his illness as an opportunity to ‘suffer for Mary’. Kolbe was an active priest and particularly keen to work for the conversion of sinners and enemies of the Catholic Church. During his time in Rome, he witnessed angry protests by the Freemasons against the Vatican. Kolbe had a strong devotion to the Virgin Mary and he became an active participant in the Militia Immaculata or Army of Mary. He felt a strong motivation to ‘fight for Mary’ against enemies of the church. It was Kolbe who sought to reinvigorate and organise the work of the MI (Militia Immaculata). Kolbe helped the Immaculata Friars to publish high pamphlets, books and a daily newspaper – Maly Dziennik. The monthly magazine grew to have a circulation of over 1 million and was influential amongst Polish Catholics. Kolbe even gained a radio licence and publicly broadcast his views on religion. Kolbe was successful in using the latest technology to spread his message. As well as writing extensive essays and pieces for the newspaper, Kolbe composed the Immaculata Prayer – the consecration to the immaculately conceived Virgin Mary. In 1930, Kolbe travelled to Japan, where he spent several years serving as a missionary. He founded a monastery on the outskirts of Nagasaki (the monastery survived the atomic blast, shielded by a mountain). Although the location on the side of the mountain was strange, its position helped it to survive the later Atomic bomb dropped on Nagasaki. He also entered into dialogue with local Buddhist priests and some of them became friends. However, increasingly ill, he returned to Poland in 1936. At the start of the Second World War, Kolbe was residing in the friary at Niepokalanow, the “City of the Immaculata.” By that time, it had expanded from 18 Friars to 650 Friars, making it the largest Catholic house in Europe. “Courage, my sons. Don’t you see that we are leaving on a mission? They pay our fare in the bargain. What a piece of good luck! The thing to do now is to pray well in order to win as many souls as possible. Let us, then, tell the Blessed Virgin that we are content, and that she can do with us anything she wishes” (Maximilian Mary Kolbe, source). On being released, many Polish refugees and Jews sought sanctuary in Kolbe’s monastery. Kolbe and the community at Niepokalanów helped to hide, feed and clothe 3,000 Polish refugees, (of which approximately 1,500 were Jews). 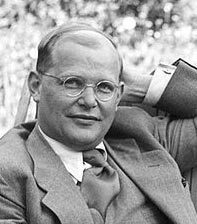 In 1941, his newspaper “The Knight of the Immaculate” offered strong criticism of the Nazis. Although Kolbe did not write this, it is believed this was a factor that led to his arrest. Shortly after this publication, on 17 February 1941, he was arrested by the Gestapo for hiding Jewish people. After a brief internment in a notorious Polish prison, he was sent to Auschwitz concentration camp and branded prisoner #16670. Kolbe was sent to the work camp. This involved carrying blocks of heavy stone for the building of the crematorium wall. The work party was overseen by a vicious ex-criminal ‘Bloody Krott’ who came to single out Kolbe for particularly brutal treatment. Witnesses say Kolbe accepted his mistreatment and blows with surprising calm. Despite the awful conditions of Auschwitz, people report that Kolbe retained a deep faith, equanimity and dignity in the face of appalling treatment. On June 15, he was even able to send a letter to his mother. On one occasion Krott made Kolbe carry the heaviest planks until he collapsed; he then beat Kolbe savagely, leaving him for dead in the mud. But fellow prisoners secretly moved him to the camp prison, where he was able to recover. Prisoners also report that he remained selfless, often sharing his meagre rations with others. In July 1941, three prisoners appeared to have escaped from the camp; as a result, the Deputy Commander of Auschwitz ordered 10 men to be chosen to be starved to death in an underground bunker. When one of the selected men Franciszek Gajowniczek heard he was selected, he cried out “My wife! My children!” At this point, Kolbe volunteered to take his place. Franciszek Gajowniczek would miraculously survive Auschwitz, and would later be present at Kolbe’s canonisation in 1971. “The ten condemned to death went through terrible days. From the underground cell in which they were shut up there continually arose the echo of prayers and canticles. The man in charge of emptying the buckets of urine found them always empty. Thirst drove the prisoners to drink the contents. Since they had grown very weak, prayers were now only whispered. 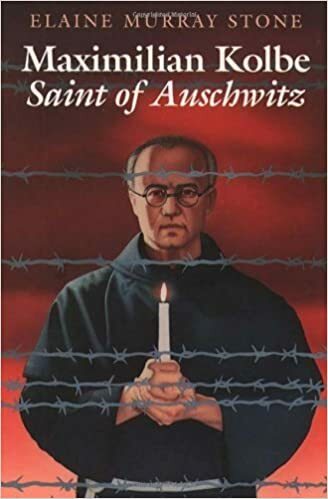 At every inspection, when almost all the others were now lying on the floor, Father Kolbe was seen kneeling or standing in the centre as he looked cheerfully in the face of the SS men. After two weeks, nearly all the prisoners, except Kolbe had died due to dehydration and starvation. Because the guards wanted the cell emptied, the remaining prisoners and Kolbe were executed with a lethal injection. Those present say he calmly accepted death, lifting up his arm. His remains were unceremoniously cremated on 15 August. The deed and courage of Maximillian Kolbe spread around the Auschwitz prisoners, offering a rare glimpse of light and human dignity in the face of extreme cruelty. After the war, his reputation grew and he became symbolic of courageous dignity. Kolbe was beatified as Confessor of the Faith in 1971. 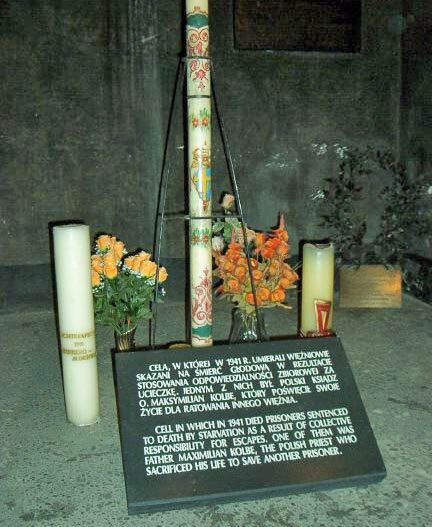 He was canonised as a martyr by Pope John Paul II (who himself lived through the German occupation of Poland) in 1981. Citation: Pettinger, Tejvan. “Biography of Maximilian Kolbe”, Oxford, UK – www.biographyonline.net. 3rd August. 2014. Updated 2 March 2019.